The Turner BioSystems TD-700 Laboratory Fluorometer in combination with Molecular Probes RiboGreen RNA quantitation reagent provides a method for ultrasensitive quantitation of RNA in solution. Detecting and quantitating small amounts of RNA is extremely important for a wide variety of molecular biology procedures. These include measuring yields of in vitro transcribed RNA and measuring RNA concentrations before performing Northern blot analysis, S1 nuclease assays, RNase protection assays, cDNA library preparation, reverse transcription PCR and differential display PCR. The most commonly used technique for measuring nucleic acid concentration is the determination of absorbance at 260 nm (A260). The major disadvantages of the A260 method are the large relative contribution of proteins and free nucleotides to the signal, the inability to distinguish between DNA and RNA, the interference caused by contaminants commonly found in nucleic acid preparations, and the relative insensitivity of the assay (an A260 of 0.1 corresponds to a 4 µg/mL RNA solution). The use of fluorescent nucleic acid stains alleviates many of these problems. The RiboGreen RNA quantitation assay implemented with the TD-700 Fluorometer can detect as little as 1 ng/mL RNA, (Figure 1) exceeding the sensitivity of ethidium bromidebased fluorometric assays(1) by 200-fold and A260 measurements by 1000-fold. The linear quantitation range extends over three orders of magnitude in RNA concentration, using two dye concentrations. Using one concentration of RiboGreen reagent and the recommended assay protocol, researchers can quantitate 20 ng/mL to 1 µg/mL RNA. By diluting the RiboGreen reagent 10-fold further, 1 ng/mL to 50 ng/mL RNA can be quantitated. Linearity is maintained in the presence of several compounds commonly found to contaminate nucleic acid preparations. Although the RiboGreen reagent also binds to DNA, pretreatment of mixed samples with DNase can be used to generate an RNA-selective assay. Figure 1. High-range (A) and low-range (B) ribosomal RNA standard assays performed using RiboGreen RNA Quantitation Reagent and the TD-700 fluorometer. Separate instrument sensitivity calibrations were carried out for the two assay ranges. TD-700 Fluorometer with standard PMT and 10 mm x 10 mm cuvette adaptor (P/N 7000-009). Fluorescein filter kit (P/N 10-086R) which includes 486 nm excitation filter (P/N 034-0486) and 510-700nm emission filter (P/N 10-109R-C) and two Blue Mercury Vapor lamps (P/N 10-089). RiboGreen RNA Quantitation Kit, supplied by Molecular Probes, Inc., Eugene, OR (catalog number R-11490). The kit contains 1 mL of RiboGreen RNA quantitation reagent stock solution in DMSO, 25 mL of 20X TE assay buffer (200 mM Tris-HCl, 20 mM EDTA, pH 7.5 in DEPC (diethylpyrocarbonate)treated water) and 1 mL (supplied as 5 x 200 µL) of 100 µg/mL 16S and 23S ribosomal RNA standard (from E. coli), in TE buffer. The kit contents are sufficient for 200 high-range (20 ng/mL to 1 µg/mL) RNA assays using 2.0 mL samples in 10 mm x 10 mm cuvettes. RiboGreen RNA Quantitation Reagent (1 mL in DMSO) is also available from Molecular Probes as a separate item (catalog number R-11491). Handling, storage and the use of the reagents should be performed in accordance with the product information sheet supplied by Molecular Probes, Inc.
Two different dye concentrations are required to achieve the full linear dynamic range of the RiboGreen RNA quantitation assay. Different working solutions of RiboGreen reagent are prepared for the high-range assay (20 ng/mL to 1 µg/mL RNA) and the low-range assay (1 ng/mL to 50 ng/mL RNA), as described below in Section 3.3. On the day of the experiment, prepare an aqueous working solution of the RiboGreen reagent by diluting an aliquot of the concentrated DMSO stock solution into 1X TE. If performing the high-range assay, dilute 200-fold. For example, to prepare enough working solution to assay 20 samples in 2 mL volumes, add 100 µL RiboGreen RNA quantitation reagent to 19.9 mL TE. If performing the low-range assay, dilute 2000-fold. For example, to prepare enough working solution to assay 20 samples in 2 mL volumes, add 10 µL RiboGreen RNA quantitation reagent to 20.0 mL TE. Prepare these solutions in sterile, disposable, polypropylene plasticware rather than glassware, as the reagent may adsorb to glass surfaces. Protect the working solutions from light by covering them with foil or placing them in the dark, as the RiboGreen reagent is susceptible to photodegradation. For best results, these solutions should be used within a few hours of their preparation. Prepare a 2 µg/mL solution of RNA in TE using nuclease-free plasticware. Determine the RNA concentration on the basis of absorbance at 260 nm (A260) in a cuvette with a 1 cm pathlength; an A260 of 0.05 corresponds to 2 µg/mL RNA. The 16S and 23S ribosomal RNA standard, provided at 100 µg/mL in the RiboGreen RNA Quantitation Kit, can simply be diluted 50-fold in TE to make the 2 µg/mL working solution. For example, 40 µL of the RNA standard mixed with 1.96 mL of TE will be sufficient for the standard curve described below. It is sometimes preferable to prepare the standard curve with purified RNA similar to the type being assayed. In general, equivalent amounts of single-stranded RNA from different sources produce approximately equal fluorescence intensity readings. The assay remains linear in the presence of several compounds that commonly contaminate nucleic acid preparations, including nucleotides, salts, urea, ethanol, chloroform, detergents, proteins and agarose. However the fluorescence intensity may be affected (see Molecular Probes product information sheet MP11490 for details) and therefore the RNA solution used to prepare the standard curve should be treated the same way as the experimental samples and should contain similar levels of such compounds. For the high-range standard curve, dilute the 2 µg/mL RNA solution into disposable cuvettes (or nuclease-free plastic test tubes for transfer to quartz cuvettes) as shown in Table 1. 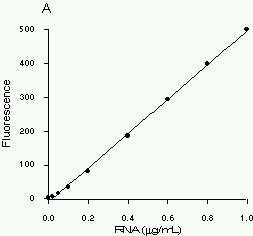 For the low-range standard curve, first dilute the 2 µg/mL RNA solution 20-fold with TE buffer to make a 100 ng/mL RNA stock solution and use this to prepare the dilutions shown in Table 2. Table 1. Protocol for preparing high-range standard curve. Table 2. Protocol for preparing low-range standard curve. Add 1.0 mL of the appropriate aqueous working solution of RiboGreen reagent (prepared in Section 3.3) to each cuvette. The high-range working solution (200-fold dilution of stock) should only be used for performing the high-range assay and the low-range working solution (2000-fold dilution of stock) should only be used for performing the low-range assay. Mix well and incubate for 2 to 5 minutes at room temperature, protected from light. Set-up the TD-700 fluorometer with a blue mercury vapor lamp (P/N 10-089), excitation filter 034-0486, and emission filter 10-109R-C. Calibrate the fluorometer in simple mode according to section VII of the TD-700 manual using the sample containing the highest concentration of RNA [Note A]. Measure the fluorescence of the remaining samples. To equalize any photobleaching effects, insert samples into the fluorometer for approximately equal time periods. The fluorescence reading of the reagent blank (RiboGreen reagent + TE buffer only) may be subtracted from that of each sample. 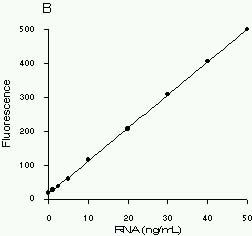 Corrected or uncorrected data may be used to generate a standard curve of fluorescence versus RNA concentration. Dilute each experimental RNA solution in TE to a final volume of 1.0 mL in disposable cuvettes or test tubes. It may be useful to prepare several dilutions of each experimental sample. Large dilutions of the experimental sample may serve to diminish the interfering effect of certain contaminants. However, extremely small sample volumes should be avoided because they are difficult to pipet accurately. In addition, the level of assay contaminants should be kept as uniform as possible throughout an experiment, to minimize sample-to-sample signal variation. For example, if a series of RNA samples contain widely differing salt concentrations, they cannot be compared to a single standard curve. To avoid this problem, simply adjust the concentration of contaminants to be the same in all samples, if possible. See Section 3.6 for information on eliminating DNA from the sample. Add 1.0 mL of the aqueous working solution of the RiboGreen reagent (prepared in Section 3.3) to each sample. Incubate for 2 to 5 minutes at room temperature, protected from light. Measure the fluorescence of each sample using the same instrument calibration conditions as used to generate the standard curve (see 3.4.4). To equalize any photobleaching effects, insert samples into the fluorometer for approximately equal time periods. If the standard curve has been constructed from background-subtracted data (see 3.4.5), subtract the reagent blank fluorescence reading from that of each of the samples. Determine the RNA concentration of each sample from the standard curve generated in Section 3.4. RiboGreen reagent also binds to DNA. Fluorescence in samples that is due to RiboGreen reagent binding to DNA can be eliminated by pre-treating the sample with RNase-free DNase, ensuring that the entire sample fluorescence is due to dye bound to RNA. Prepare 10X DNase digestion buffer: nuclease-free 200 mM Tris-HCl, pH 7.5, containing 100 mM MgCl2 and 20 mM CaCl2. Add 0.11 sample volume of 10X DNase digestion buffer to each DNA-containing sample (for example, to a 9 mL sample, add 1 mL 10X buffer). Add about 5 units of RNase-free DNase I per mg of DNA thought to be in the sample. Incubate the sample at 37°C for 90 minutes. Dilute the sample at least 10-fold into TE to diminish effects of the digestion buffer salts on the RiboGreen assay procedure. Perform the RiboGreen assay as described above. [A]. For optimal detection sensitivity, separate calibrations should be carried out for the high range and low range assays. 2. Sambrook, J., Fritsch, E.F. and Maniatis, T., Molecular Cloning: A Laboratory Manual, Second Edition, Cold Spring Harbor Laboratory Press (1989). RiboGreen is a trademark of Molecular Probes, Inc. RiboGreen RNA Quantitation Reagent is covered by current or pending U.S. and foreign patents.